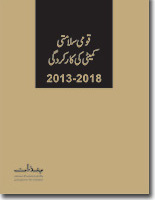 This is Urdu version of “Performance of the National Security Committee 2013-2018”. Since its formation, Pakistan has struggled to find a stable structure to balance civil-military equation in the country. Ascendancy of the military in policy-making spheres has been the biggest hindrance in the consolidation of democracy in Pakistan. Other than four direct military interventions spanning a total of 30 years, the military has assumed de-facto authority on various aspects of governance including foreign policy and defence. The performance of the National Security Committee 2013-2018 report is prepared by PILDAT in the backdrop of principle of democratic oversight of defence and national security. It is the continuation of PILDAT’s previous reports that examined the performance of the DCC during March 2008 to March 2013 and Citizens Report on Performance of the National Security Committee June 2013-May 2014. The report closely examines the publicly available data and the reports in the media regarding the meetings and performance of the NSC. The objective of the report is not to offer a critique of the work of the Committee but to analyse the performance in the backdrop of peculiar security needs of Pakistan and the role NSC is playing with respect to defining and influencing policy and principles of defence and national security. It presents reform proposals for the new government in conclusion. The report is part of PILDAT’s larger focus on improving civil-military relations in Pakistan in the light of the Constitution of Pakistan.